It does not try to teach web mastering from scratch. It does not try to teach java scripting from scratch. It does not bore with an endless recitation of technical details. Meta tags... the all important title, keyword placment and density. Descriptions that display in Google listings... makes people want to click. Shows how to dress up lists to make them more attractive. 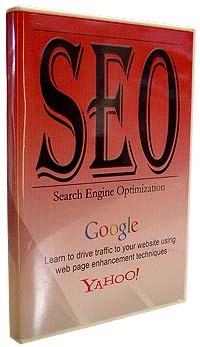 Shows how make ordinary pictures bring life to a page..
gain a high ranking on search engines. Shows how to make visitors want to buy once they're on your site. Uses real internet sites as examples of the key points...let's you see how other have done it. Makes you realize that you can do it, too... even if you don't create websites yourself, this SEO video will allow even the nontechnical person to make sure his developer is adhering to proven principles. A printable pdf file containing a detailed outline of the video with links to all the demo pages. And much, much more. See menu of all items on the DVD. view the menu of 30 SEO videos. Click on the DVD icon to view the five Free SEO videos. ....but do they know how to make it top ranked in Google?